Academic Publishing and Profit Squeezing – a Way Out. I just Skyped Dr. George Nash to ask what kind of financial return he gets from having a paper published through the traditional academic publishing model, and he told me it amounted to nothing at all. Others have told me much the same story. So here we have a business model in which the content provider – the person who makes the business model possible in the first place – receives absolutely no financial reward for their efforts. Of course getting paid is not the driving force behind an academic producing a paper– rewards may come later in different forms – funding, a better job, and other, less material recompenses – but the paper itself is never produced with the thought that it may itself generate a direct profit. 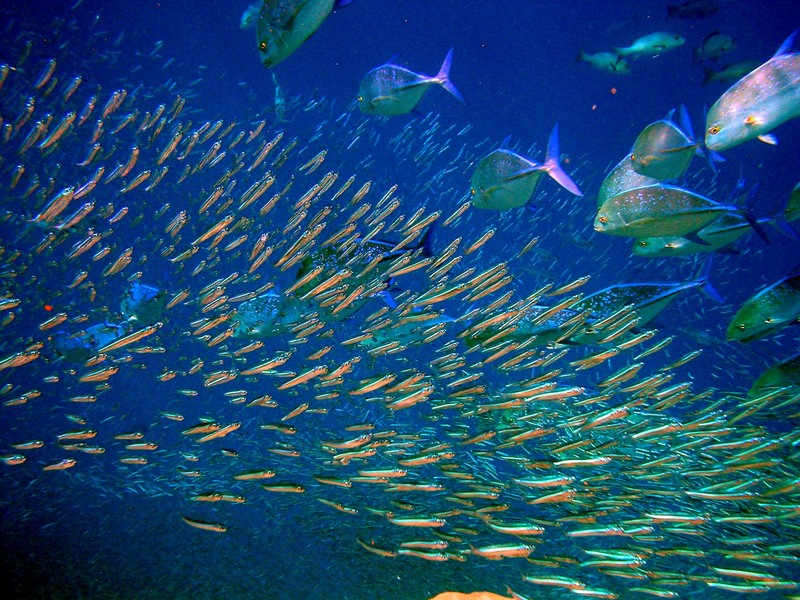 A school of bluefin trevally working a school of anchovies, which may compact into a spherical bait ball if they are sufficiently threatened. Image courtesy of Bruno de Giusti. Profits are the territory of the publisher, and understandably, they guard their territory fiercely. Up until the advent of digital technology their business model made perfect sense. Producing and distributing a paper document is an expensive business with an extensive supply chain. Additionally, even their most popular publications would be niche material, produced in small numbers, to a high standard, often including illustrations which would be a further expense. Subsequently, other than the occasional well off interested individual, the only buyer of this material would be an institution – a library, more precisely. However, now that digital technologies have reduced production and distribution costs by an enormous degree, this reduction has not been passed onto the institution either in a direct reduction of fees, or an increased amount of value for the same fee. Equally importantly they have also failed to take advantage of wider distribution possibilities. Now production and distribution costs have fallen, and access to documents has increased, the niche market that generated the need for high prices to make a return on the original investment is no longer the niche it once was. So we have a massive reduction in distribution costs, combined with a huge increase in potential readership. The readership has increased not just because of the global reach, but also because the individuals no longer have to go through the institutions to find your product. They can arrive directly at the publisher through their website. The point of sale has changed focus entirely. Publishers have responded to this by offering individual subscription deals, or one-off payments for single documents. This is a good thing. Or rather, this is a potentially good thing. In 1932 the British archaeologist John Pendlebury wrote a paper entitled ‘Archaeologica Quaedam’, which was published in the journal Greece and Rome. It’s an interesting read, much of which is cautioning the archaeologist against using overly technical jargon for fear that archaeology will itself turn into an impenetrable mystery. I can recommend it – you can find it here (http://www.jstor.org/discover/10.2307/641516?uid=4&sid=47698789784157). You can also read it if you want to – however if you don’t belong to an institution which has a JSTOR subscription it will cost you $19 USD, (£12.00). That’s not for site access by the way – that’s for the one 80 year old document. Now say 100 people followed that link. How many do you think would shell out $19 to read past the preview? I have no way of telling unless 100 people get back to me about it, so I’m going to guess, and my guess will be – let’s be generous – 1. So $19 to JSTOR. So what would happen if the same 100 people followed that link only to find that JSTOR wanted $1? I’m going to have to guess again, and I’m going to be generous again. I’m going to guess 5. $5 to JSTOR. But I’m also going to guess that if they enjoyed it they will recommend the paper elsewhere – possibly even reference it in their own work – and potentially drive more people to JSTOR to spend money. Here’s some more guessing. I’m going to guess that if people want to read that article enough and they think the price for it is way too high, then they’re going to find a friend with JSTOR access and ask them to download it and email it over to them. I’m also going to guess that their friend – who probably also thinks the charge is disproportionate, will almost certainly do it. So how can academic publishers put a stop to this intellectual black market, where knowledge – the distillation of human thought for the betterment of the species (we can at least hope) – is being transformed into the status of contraband, and covertly passed under the electronic table like a ripped DVD? You charge less. More people will become customers. You will make more money. Here’s another incentive. Now everyone with access to a computer can create that same distribution network for a very small investment, it’s only a matter of time before someone will work out that by using this reduced overhead model, there will be enough money left over to actually give the content provider a cut. And then the only way to stem the exodus of content providers will be to pay them. To do this, you’ll have to rearrange your business model along the same lines as your upstart competitor and try to catch up. Or here’s a thought – change now and lead the way. DigVentures – Funding Target Reached – What Now? I will add that for the past three years, myself and Newcastle University colleague Aron Mazel have being trying to publish a rock art reader (using a series of previously published milestone papers). Despite a very positive response from authors (i.e. those who wrote the dam thing), the majority of publishers have been wanting to grab their pound of flesh, charging around £700 per paper to republish. No can do! You’re right. Times are changing. Scholars the world over, like yourself, are noticing the lack of value associated with traditional publishers. There are many web applications attempting to lower the barriers to entry for the dissemination of scholarly work online. There are web applications in this space that are end-to-end systems that allow scholars to form journals and accept manuscripts, find peer-reviewers, and publish work online. Scholastica and Open Journal Systems fit into this category (Full disclosure: I’m part of the Scholastica project). There are also systems to help scholars share their research and meet collaborators: Mendley and Research Gate . Many people question why these platforms haven’t gained wider adoption. The simple answer is that senior researchers are complacent enough to work within the current system – it’s all they know. In many cases, the system has been very good to them. For junior researchers, they lack the prestige to get people to listen to them when they suggest alternatives. We’re seeing today through scholars such as Tim Gowers , it is possible for senior academics to explore the idea of a paradigm shift. Not only that, they are able to get others on board (see Prof. Gowers’s Cost of Knowledge campaign that have resulted in tangible outcomes.